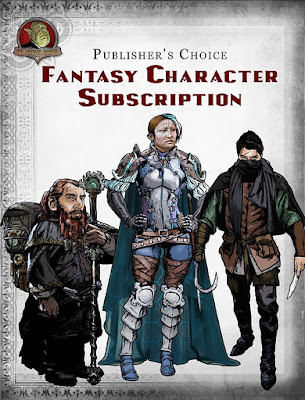 Fat Goblin Games has recently released +Rick Hershey 's latest stock are subscription, the Fantasy Character Subscription. It clocks in at $95.95 and will be releasing approximately 1 character image a week until Rick hits 100 images. For those doing the math at home, thats less than 96 cents an image once the subscription hits it end date. I'm already a subscriber to Rick's Publisher's Choice - Creatures A to Z: Subscription (amazing work, just don't ask what my first self published release will be ;) Really, for the quality art and the final price per piece of that art, it simply can't be topped if you are in the market for stock art. This new line of stock art aims to bring you a huge variety of popular and diverse fantasy characters presented as single image download! This file includes 300dpi Tiff at 4x6 or larger with transparent background images featuring a full-color depiction of a fantasy character! One character added every week! The Publisher's Choice - Fantasy Character Subscription in the next 24 months, I will release 100 pieces of art, at roughly 4+ pieces per month until I hit 100 pieces. And you can buy it now, for about $100! Also, subscribers have access to being able to submit ideas for character art! The idea is OK, but I fail to see how the three characters on this cover are substantially better than your "Far West" avatar you were so disappointed about. I've bought their stock art before, but I am on the fence about getting this one. Most of Fat Goblins/Rick Hershey's stuff has been great but it's hard to tell what sort of style the later figures are going to have.